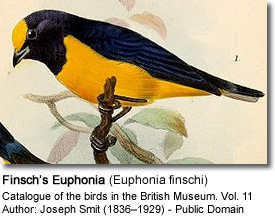 The Finsch's Euphonias (Euphonia finschi) are South American finches that occur naturally in the northern countries of Venezuela (near Santa Elena de Uairén and Cerro Roraima, in extreme southeastern Bolívar), adjacent northern Brazil (northeastern Roraima) and east across central Guyana, western and northern Suriname and northern French Guiana. Euphonias are known for their almost constant singing. The whistles of the Finsch's Euphonias are described as clear dee,dee, dee's .